We get a lot of mail at NPR Music, and amid the piles of new CDs and holiday cards from local merchants are many smart questions about how music fits into our lives — and, this week, ways to delve into unfamiliar genres. "It is so easy to maintain your interests in particular areas of music while never broadening your horizons. How does someone jump into new genres — and otherwise delve into new territory — when they have no experience?" I feel like just asking the question is half the battle: You're not going to get into new things until you've decided that you're ready to do so — and decided that the exploration is worthy of time and attention away from music you've had an easier time enjoying. Once you've avoided or otherwise conquered the insidious notion that there's no merit to be found in genres you think you dislike, you're free to dip a toe in fresh waters. The second step (in this pursuit and in so many others) is to free yourself from the shackles of how you fear others might perceive you. Let's say you want to get into jazz. If you approach jazz as a language you must learn how to speak fluently lest you get mocked by the genre's elders and experts, then you're likely to get discouraged from going to jazz clubs, talking to jazz fans, posting questions on jazz blogs and otherwise immersing yourself in a world that wants you to come hang out. Out yourself as a dabbler! Ask nicely to be invited in, and 19 times out of 20, you'll get invited in. 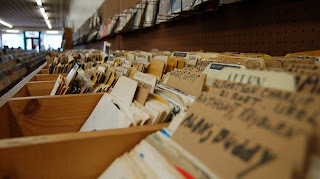 This is part of why the disappearance of so many record stores is such a shame: Like good fans, good record-store clerks love it when people ask for tips on new things worth trying — if you ask for interesting recommendations in good faith, most record-store clerks will be reluctant to let you leave the store at all. But there are ways to cobble together a similar experience online, from algorithm-based services like Pandora and Rdio and Songza and Spotify — where you can wander down rabbit holes based on the recommendations of sources you trust, or simply get a quick crash course in what's popular at the moment — to, and you knew I was going to do this, NPR Music, where curators are there to lead conversations and point people in the direction of artists worth discovering. Curious about jazz? Splash around in A Blog Supreme, starting with the introductory Take Five lists of "jazz samplers." Want to dig into classical music as a living, breathing world full of new ideas? Deceptive Cadence is full of recommendations and playful ways to roll around in the unfamiliar. There's no membership card required for enjoying any strain of music imaginable, so don't be afraid to approach knowledgeable enthusiasts — bloggers you like, fan communities, social-media resources, et al — and go in belly-up. "I barely know anything about [jazz, hip-hop, goa trance, crabcore, whatever], but I really want to learn more and discover music I'd love. Tips on getting started?" What's the worst that's going to happen, really? "He's expressing an interest in stuff we like! GET HIM!" All across NPR Music, we're constantly looking for ways to provide music fans with accessible entry points for genres and sounds that might be unfamiliar — which is one reason I recommend at least skimming the first song of every Tiny Desk Concert. I thought reggae music wasn't my thing until I loved stripped-down performances by singers like Tarrus Riley and heard familiar sounds in new ways. I never thought jazz violin would interest me until the day Regina Carter blew me away. Now, I've got those performances in my back pocket as simple starting points that can help knowledgeable friends lead me to more. Finally, I'd encourage you — and everyone else — not to get discouraged if you do a little digging and decide that a sound or genre simply isn't to your liking. There are only so many hours in a day, and countless lifetimes' worth of music flood every corner of the marketplace. Open your mind to new sounds, but if you don't like what you don't like, don't beat yourself up. The only wrong answer is closing yourself off to new things before you've given them a chance. "How do I find music I'll like without asking my friends, so I can keep the façade that I'm cool?" Okay, I know you're joking and everything, but I do have an actual, serious bit of advice that doesn't involve shedding the pursuit of coolness like so much dead skin. Namely, that joining the online communities I mention above — fan pages, various social media, and so on — is a great way to not only admit ignorance without repercussions, but also expand your circle of friends. Ask strangers to recommend music, and some of them will eventually become the sort of people from whom you'll hide embarrassing admissions in the future.